What is a Minnie Box? It is our gift to you for choosing Magical Vacations by puchasing a qualifying vacation package! Some agencies, send flowers, fruit, $25 credits... we like to say we offer a high level of guest service, assistance and a way to experience your vacation even before you leave! The Minnie Box is a $250 value of planning, service & fun! Ask your Magical Agent for how to qualify. How did the Minnie Box come about? Since 1997, Magical Vacations has been delivering the Disney Voucher & Coupon booklets to guests with Melissa's Disney Park Itinerary, planned for their family, in a folder wrapped in a big yellow bow. Many times guests would say outloud... "I feel like I am opening a gift!" This excitement resonated within Melissa for years. How could we help our guests feel as if they were really getting a gift? How could we create something special? In 2012, Melissa created & Trademarked our "Minnie Box"! We deliver all our qualifying Disney Vacation Package documents inside this special creation so that you have a way to celebrate on your own! Every Box is unique. The contents are never the same... and vary depending on the type of vacationer you are and who will be travelling with you! You may choose to share the box with your guests so that they get to "open" their vacation before you leave... or surprise your children with the vacation! When does the Minnie Box arrive? Depending on when you booked your qualifying vacation package... the Minnie Box will arrive within 2 weeks of departing for your vacation. You see... Disney is actually paperless. meaning, there are no real documents. You register on-line and receive everything else at your home or at check in! Magical Vacations, however, understands that many of you still like to receive SOMETHING in the mail before your depart! We make sure this happens! 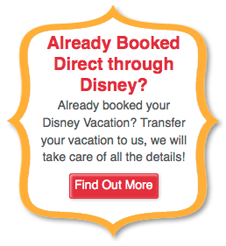 What do I get if I book a room or tickets that do not qualify as a Disney vacation package? We do understand that everyone wants to feel special. You still want a high level of guest service to help you in your vacation planning! So in order to make this happen... we have created a packet for just this occasion! Just ask your Magical Agent for details! Would you like to document your vacation? Want a great way to stay in touch with all things delicious at Walt Disney World? Follow this food blog from Kingdom Cuisine! October 4th - "Unravel Disney Travel"
November 1st - "Adulting at Disney Destinations"
January 3rd - "Cruisin' with Disney around the World"